When Eileen Costello, MD, chief of Ambulatory Pediatrics at Boston Medical Center, entered the room to see her next patient, the last thing she expected to hear was, “I can’t believe it, it’s Doctor Costello!” The surprised response came from a familiar face, one that she had not seen for more than 15 years. Now bringing her own children to see Costello, it was a vast change from when Nicole St. Pierre was last in her office, as a patient herself. At that time, only in her teens, Nicole was facing unfathomable challenges after the loss of both of her parents. Sadly, this only scratched the surface of what she would endure in the years to come. Homeless and addicted to drugs, Nicole spent nearly 10 years living under a bridge in Boston and going in and out of prison. When she became pregnant, she was deep in the throes of a powerful addiction and a dangerous lifestyle, posing many risks to her unborn baby. Thirty weeks pregnant with little prenatal care and the odds seemingly against her, she decided to seek help and knew exactly where to turn. “Everyone knows that if you are pregnant and hooked on drugs, you can go to BMC,” Nicole explains. 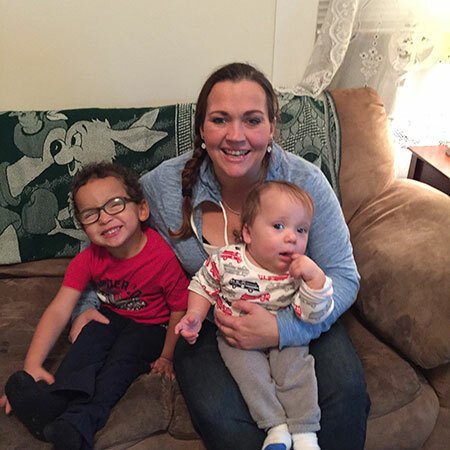 Through Project RESPECT, Nicole was connected to a local women’s shelter to spend the remainder of her pregnancy in a safe environment. A few weeks into her stay—and 12 days into her sobriety—Nicole went into labor early, delivering a baby boy through an emergency cesarean section at BMC. “They held him up so I could see him and then immediately took him away,” Nicole recalls of her first moments with her son, Sammy. Premature, suffering from numerous congenital issues—including a heart condition and underdeveloped lungs—and exposed to drugs, Sammy was intubated and taken to the neonatal intensive care unit (NICU), under the care of neonatologist Alan Fujii, MD. “Sammy was really quite sick,” explains Fujii. “Even his blood pressure was low because he had used up all of his stress steroids staying alive in the womb.” In the weeks he spent in the NICU, doctors and nurses worked around the clock to transition Sammy from drug exposure and help his lungs develop. With each passing day, Sammy gained more strength. And Nicole did, too. “Before Sammy was born, I didn’t have anyone in the world,” she says. “I needed a support system, and all of the doctors, nurses and social workers along the way—from Project RESPECT to the NICU, to pediatrics—became that for me. They advocated for me and made me feel that I could be a good mom. I never experienced that kind of support before.” In the same way they were committed to Nicole’s well-being, the NICU team strove for Sammy to beat the odds. “Sammy responded nicely to all of our treatments and was eventually able to go home in good condition,” says Fujii. “But he kept us busy that first 24 hours in the NICU.” “Dr. Fujii saved his life,” adds Nicole.